Clay Buchholz gave up six earned runs in just five innings of work Thursday night in the Red Sox’ 8-2 loss to the Colorado Rockies. His ERA rose to 6.35 and his record dropped to 2-5. Eduardo Rodriguez, who has spent the first two months of the season rehabbing in Pawtucket, is scheduled to make his first start of the year against the Orioles on Tuesday. As many anticipated, E-Rod will be taking the place of Buchholz in the rotation. Fans were relieved Friday when John Farrell announced that Clay would be relocated to the bullpen. 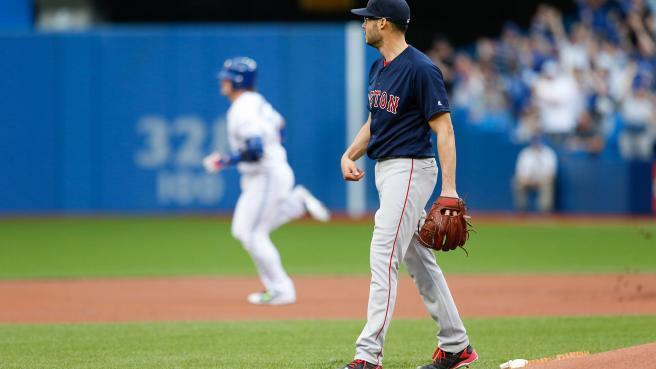 On Friday night, Joe Kelly had a hard time with the Toronto Blue Jays as the Sox lost their second straight game. He gave up five earned runs and lasted just four and two thirds, surrendering two solo homers. One to Josh Donaldson in the first and one to Justin Smoak in the fifth. Kelly also allowed an RBI double to Donaldson in the third and an RBI single by Donaldson in the fourth. The Blue Jays’ slugger capped off his night with a game-winning two-run blast off Koji Uehara in the eighth, his second dinger of the night. He finished with four hits and five RBI’s. The Red Sox had previously won five out of six before these two consecutive losses. They’ll send the 7-2 Rick Porcello to the hill on Saturday afternoon, so hopefully he can get their starting pitching back on track.